Caipirinha chicken, yogurt flatbreads, spicy pepper sauce, herb salad | dash.drizzle.dollop.devour. It’s virtually impossible to ignore a certain sporting event going on in Brazil at the moment, it’s even invaded my kitchen! I have fond food memories from my travels in Brazil. Plenty of balmy evenings were spent relaxed in a bar, enjoying the amazing array of snacks and small plates paraded around, tempting you to seize the opportunity before they pass by. Platters piled high with hot coxinhas – delicious gooey croquettes filled with chicken and cheese, pão de queijo, empadinhas, outsized skewers of grilled meats…all ready to be washed down with a cold caipirinha or two. So back to the balmy-ish days of June in the UK, where a warm summer’s evening brings the inevitable scent of charcoal wafting on the breeze. I find the lovely long light evenings of June just enchanting, when it is light and warm till nearly 10pm. If the temperature holds up, an evening sat outside in the garden till twilight is a rare treat. So the combination of a long warm evening, the BBQ out and Brazil on my mind led me to dream up caipirinha chicken. I wouldn’t imagine for a second that this dish has even an inkling of Brazilian authenticity to it, but I liked it anyway. First things first. 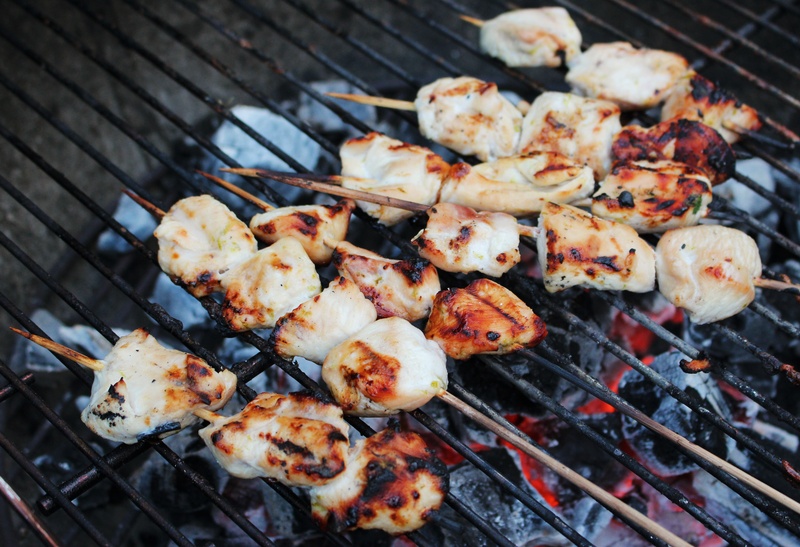 If you are going to use wooden skewers to cook the chicken, start soaking them in water now to minimise the risk of them going up in flames on the heat. Then make the bread dough. This really must be the simplest bread recipe possible. No faffing about with yeast, waiting for dough to rise, kneading for ages. Just stirring and rolling. Do give it a go, bread cooked on the BBQ is amazing. Weigh 200g plain flour into a bowl. Add a good half teaspoon of salt and 2 teaspoons of baking powder and stir to combine. Then stir though 200g Greek yogurt and knead briefly to form a soft dough. Wrap in cling film and put in the fridge for at least half an hour to rest. Next make the marinade for the chicken. Measure out 3 tablespoons of cachaca, white rum being an acceptable substitute. Squeeze in the juice of half a lime (up to a whole lime if your lime isn’t very juicy, such is their want), a scant teaspoon of light brown sugar and a good grind of salt and pepper. Cut 400g chicken breast into cubes and add to the marinade. The acidity of the marinade will start to tenderise the chicken, turning it slightly white round the edges. Set aside for 20 minutes or so in the fridge whilst you make the pepper sauce. Drain a 200g jar of roasted red peppers and tip into a blender. Add 2 chopped red chillies, seeds in or out depending on how hot you would like it, 1 crushed clove of garlic and the zest and juice of 1 lime. Blitz briefly until a rough puree forms. With the motor still running, drizzle in light olive oil under you have the desired consistency – I used about 50ml. You want a thickish sauce. Finally add a good handful of chopped coriander and a half teaspoon of sumac, if you have it, and blend again to combine. Finally for the herb salad. Chop half a cucumber into small cubes. Finely slice 4 spring onions and add to the cucumber. Roughly chop two handfuls of flat leaf parsley and another handful of coriander. Dress lightly with a little white wine vinegar and olive oil, although I would hold off dressing the salad until you are ready to serve. Get your bbq going, then thread your chicken pieces onto the skewers. Reserve the leftover marinade to brush over the chicken periodically whilst its cooking. Divide the bread dough into 6 equal sizes pieces and shape each one into a rough ball. Generously flour your work surface and then roll the dough out into rounds just a couple of millimetres thick. Mine were about 20cm in diameter. Interleave the circles of dough with greaseproof paper, so you can stack them on top of each other to transport to your BBQ without them sticking together. 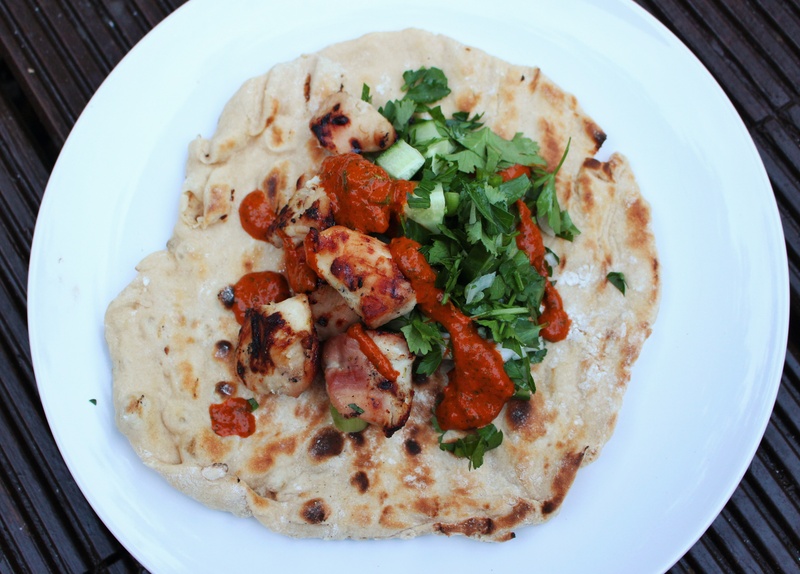 Start by cooking the chicken skewers then push them to one side to keep warm whilst you cook the flatbreads. Deftly place each round of dough directly onto the grill. Don’t worry, it won’t stick or melt through the bars. The dough will brown quickly and will start to bubble and rise. Depending on the temperature of your BBQ, It will only need around 1 minute on the grill before turning. If it seems stuck to the bars it probably just needs a little longer to cook, but once lightly browned, the bread should come away quite easily with a pair of tongs. Flip the dough decisively and cook the second side for around 1 minute until crisp and brown. It’s probably easiest to cook each bread separately so you can keep an eye on them. Pile chicken and herb salad on top of the bread and drizzle over a generous quantity of the pepper sauce. Serves two plentifully. Shopping list: 400g chicken, cachaca, 200g plain flour, 200g greek yogurt, 2 limes, baking powder, 200g jar roasted red peppers, 2 red chillies, bunch of coriander, bunch of parsley, cucumber, spring onions, garlic, olive oil, sumac, brown sugar, wooden skewers, greaseproof paper.